The stylish and aesthetically crafted Storeall fire retardant vinyl resin plastic shed has large 61 inch wide and 71 inch tall double entry doors and 2 vents for air circulation. It's impervious to wood eating insects and won't rust, rot, dent, mildew or ever need painting. It has heavy-duty galvanized steel interior beams, trusses and reinforced steel columns for shelves. It comes with a galvanized steel foundation kit. It's easy to assemble with easy to read bilingual instructions. The stylish Storemate fire retardant vinyl resin plastic shed is a perfect complement to any backyard. It has 60 inch wide and 78 inch tall double entry doors, large storage, a floor, a side window and 2 air vents for circulation. It won't rust, rot, dent, mildew or ever need painting and is impervious to wood eating insects. The Storemate is supported by interior heavy-duty beams, trusses and reinforced steel columns for shelves and is easy to assemble with easy to read bilingual instructions. The Jardin Ultra is an extra-large horizontal shed characterized by quality engineering, heavy-duty structure and stylish wood-look design. It is a versatile and multi-purpose storage unit, wide and high enough to store various items without taking up too much space. This shed offers a specialized solution for two 360L/96 gal trash cans, and comes with a lid-to-lid chain for hands off opening. Vertical Storage Shed Transform your patio, lawn or garage into a storage magician. 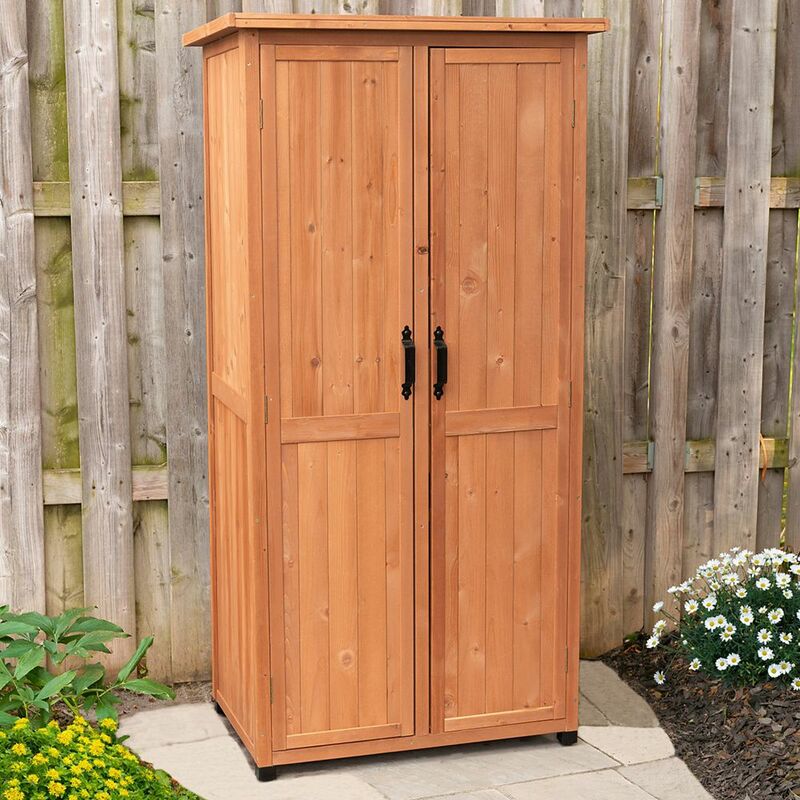 This vertical storage shed is like a tall spacious locker, only more attractive and stronger because its crafted of solid wood harvested from the Cypress tree family. Great for storing tools, lawn and gardening supplies, pool accessorieseven sporting equipment. Features double panels for quick, easy access. Pad lockable doors keep items safe from pests and thieves. Protective coating maximizes weather protection. Simple to assemble. Ships anywhere in North America. Vertical Storage Shed is rated 3.8 out of 5 by 23. Rated 4 out of 5 by Eric from It went up pretty easily. Some wood split when I... It went up pretty easily. Some wood split when I was screwing into the ends. I think there should have been pilot holes there. But I managed to get it together and it went througha couple of heavy rainstorms with no leaks. Rated 5 out of 5 by HomeDepotCustomer from Great value.... Great value. Rated 5 out of 5 by Margaret from Everything arrived just fine. The only problem was with the... Everything arrived just fine. The only problem was with the instructions. Terrible!!! Rated 4 out of 5 by Ecowoman from Took me about an hour to assemble, solo. Would have been nice to been packed with instructions so... Took me about an hour to assemble, solo. Would have been nice to been packed with instructions so spent time to find them on the Leisure Season website. Once found, no text, just pictures, which aren’t totally functional to build with. Thankfully found a photo of finished with open doors, so I could landmark some items (a bit confusing to determine which side and which is up/down). Got it done, and looks good. My product will be under a deck, so not subject to strong weather elements. Will stain and caulk it next. A 3rd shelf would have been more practical, they are a good size and fits all my hot tub chemicals and gardening goods on the tall side. Put my own hooks in, high up (can’t screw thru the walls, too thin, but I screwed into the braces).